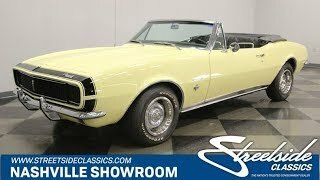 Hi, I am interested in your 1967 Chevrolet Camaro RS (stock #1225-NSH) listed on Autotrader for $56,995. I'd like to get more information about this vehicle and confirm its availability. A rare find. A highly optioned first year RS, special ordered by a GM employee. Numbers matching, correct and original with a focus on keeping things stock and rebuilding the original pieces where possible during maintenance or repair. This is one for the purist collectors out there. It has also been cared for by the same owner for the past 26 years. Check it out. This car has good, solid, and original Y-2 Butternut Yellow paint. The original owner checked about every box on the form when they ordered this car too so, it has the appearance group which includes things like the bumper guards both front and rear, chrome wheel well moldings and rocker trim. All the chrome as well as the stainless on this car is in excellent condition and its all polished up nice and bright. Of course, being an RS, it has the hideaway headlights up front which work quite nicely. Everything on this car works properly, so thats not a real surprise. The bumblebee stripe has the RS designation within it and a 327 badge on the fenders is a giveaway about the precious prize under the hood. The RS badges on the grill and gas cap are the real deal and of course the box was checked for power operation on the Black convertible roof which also has a nice boot to dress it out while it is folded down. Open the door, or just look inside if the roof is down, and you will find a completely stock interior, again, with all the options that could be ordered in it. You will notice the switches for the rarely ordered power windows on the door panel, and the gauge package in the center console includes fuel, water temp, oil pressure and voltage monitors as well as a clock. A three-spoke deep dish steering wheel is mounted on a tilt column and sits in front of a stock tach and speedometer that is indicating 70,913 miles that are believed to be accurate and original. Ventilation controls include those for the factory A/C which blows nice and cold and the control knobs as well as the chrome trim and T-handle shifter for the automatic transmission have a patina on them that only comes with age. The seats and the carpets on the other hand have been replaced and help make this interior look fantastic. Open the hood and you will find a very desirable and numbers matching 327 cubic inch motor nestled down in a completely stock engine bay. The motor and drivetrain on this car have received some quality reconditioning with a commitment to maintaining originality and to rebuilding, rather than replacing parts where possible. The engine has had its seals and gaskets replaced along with a fresh coat of Chevy Orange paint with proper 327 Turbo-Fire decals on the valve covers. The original air conditioning compressor was rebuilt with new parts like the expansion valve as well as getting new hoses and receiver dryer. The 2-speed Powerglide transmission was rebuilt also getting a new flex-plate and torque converter in the process and the u-joints were replaced while the driveshaft was out too. Power front disc brakes are another nice option ordered on this 67 and they have been serviced up end to end. Steel wheels with chrome trim rings and center caps with 205/70R14s complete the look of this car nicely. It doesnt get much better than a 67 RS, numbers matching convertible with all the options the factory had to offer. If this is your kind of car, then call or come down and check it out. We dont expect this one to last long.